There is a joke that vegans will make bacon out of anything, and it’s funny, because it’s true. 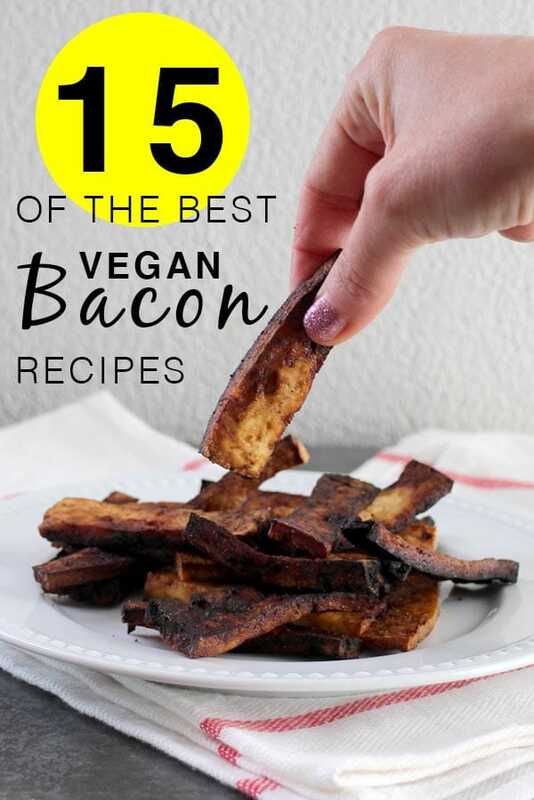 If you love animals but also bacon, try these amazing vegan bacon recipes! Why bother with vegan bacon? Vegans love bacon, because vegans are humans. What we don’t love is hurting animals just to make that smoky, sweet breakfast staple. And there is no need to do that with so many delicious vegan bacon options out there! 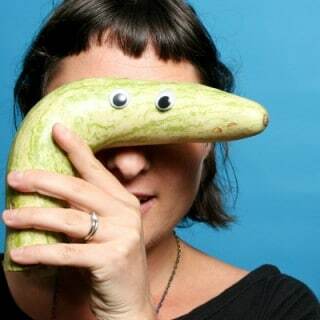 There’s a perception that eating vegan is some kind of contest to see who can eat the most “pure” diet, free from anything fun and flavorful. That couldn’t be further from the truth! Sure, there are vegans out there following very restrictive diets, but most vegans just want to feed our faces without harming animals. If vegan bacon seems like an oxymoron to you, I encourage you to read my Care2 article about why so many vegans eat meat and cheese alternatives. The tl;dr version is that vegan meat tastes good, and vegans like food that tastes good. Creating vegan bacon is all about balancing your smoky, salty, and sweet flavors and a bit of acidity. You can do this in a number of different ways, and the recipes below showcase many of the delicious options available to you. For the smoky flavor, liquid smoke is the easiest choice. Liquid smoke is made by burning wood or charcoal, then using a condenser to capture that flavor in water. If you are worried about liquid smoke and health, you have another great smoky option out there: mild chipotle chili powder. Definitely use mild chipotle powder, unless you want very spicy bacon. Even the mild stuff will bring a little bit of heat to the mix, so just be aware of that, if you go that route. My shiitake mushroom bacon recipe uses chipotle powder instead of liquid smoke. You can use salt, miso, soy sauce or any other salty staples to give your vegan bacon its signature saltiness. Since most vegan bacon recipes start by marinating your main ingredient, I tend to go with soy sauce. The liquid helps give your bacony marinade more volume. For the sweet part of your vegan bacon’s flavor profile, you have as many options as there are sweeteners. I like using maple syrup, but you can use agave nectar, brown sugar, or even white sugar. For my tofu bacon, I use maple syrup and balsamic vinegar. The balsamic brings sweetness and a nice acidity to the mix. Speaking of acid! You want some in your vegan bacon recipe. Vinegar, lemon juice, and lime juice are all great options here. Adding oil to your vegan bacon recipe is optional, but I recommend it, if you do oil. Conventional bacon is greasy, so if you want your vegan bacon to mimic that, don’t skimp. Refined coconut oil, olive oil, or neutral cooking oils all work well in vegan bacon recipes. You can use unrefined coconut oil, if you don’t mind your bacon tasting coconutty. If you don’t do oil, nut butter is a great way to add some fat to your vegan bacon without oil. The rice paper bacon recipe below uses a nut butter marinade to get that fatty goodness with no added oil. Ready to get your vegan bacon on? The recipes below use everything from tofu and nuts to an array of veggies to make the best vegan bacon OF YOUR LIFE. If you know me, you know that I’m obsessed with tofu. This tofu bacon is super easy to make, and you can cook it up in the oven or in the air fryer. Choose your own bacony adventure! Tofu bacon is lovely in a breakfast sandwich or as a side dish. I’ve even snacked on the leftovers, cold, and they’re surprisingly delicious! 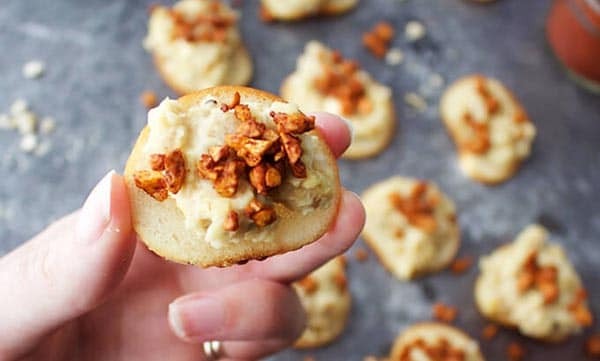 You can make bacon cashews in the oven or in the air fryer, as well. 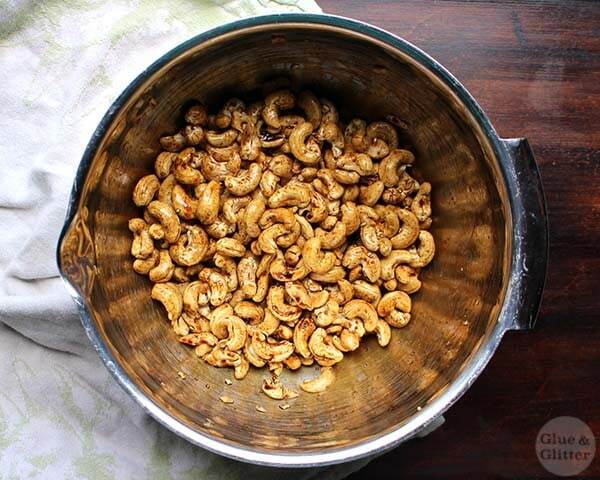 The video above shows you how to make air fryer bacon cashews. These are perfect for topping salads or adding crunch to a sandwich or wrap. Or for straight-up snacking. 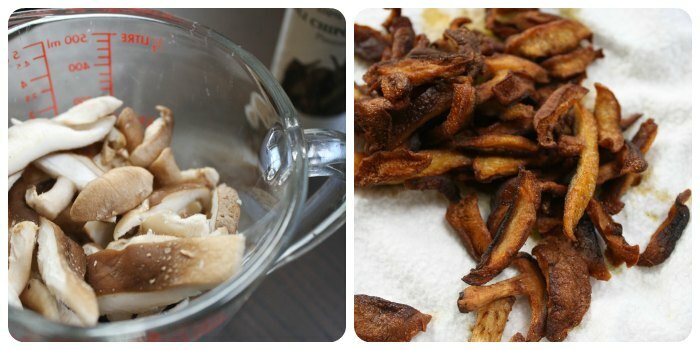 I sometimes get questions about how to make vegan bacon without liquid smoke, and this addictive shiitake mushroom bacon is a great option for that. It uses mild chipotle chili powder to get that smoky flavor without any liquid smoke. Serve your mushroom bacon on top of a grits bowl, over a salad, or use it in sandwiches and wraps. 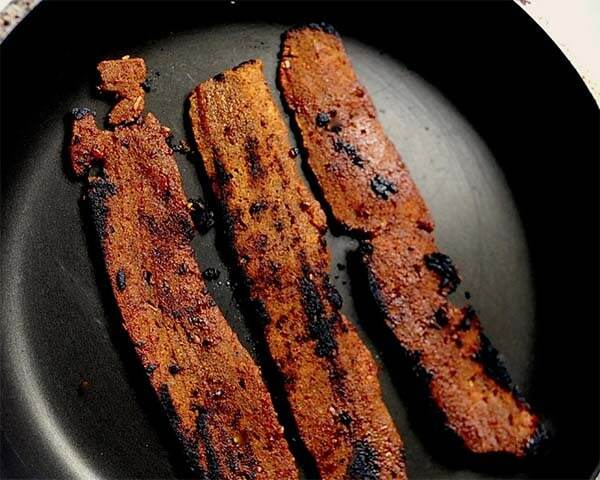 It is so easy to make this flavorful, vegan tempeh bacon! To get the deepest flavor, marinate your tempeh overnight, then bake up that vegan bacon goodness in the morning. I created the vegan bacon recipe above for a bacon sandwich recipe at Care2, but you can use it anywhere that you’d serve strips of bacon. Kristina at Spabettie makes her rice paper bacon with a double layer for thick-yet-crispy results. Just coat the slightly softened rice paper in a cashew butter mixture, then bake to bacony perfection. Kristina’s bacon is fabulous alongside a tofu scramble but also works well in sandwiches and wraps. You can also break it up to top your next salad! 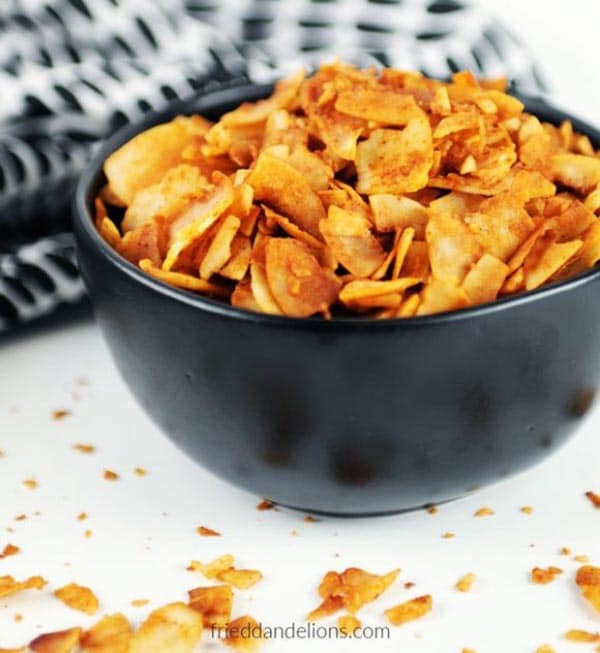 Sarah’s coconut bacon is quick and easy to make. Just toss together the coconut flakes and marinade, then bake them to bacony perfection. This is great spinkling bacon. Use it on salads, sandwiches, or to take your next avocado toast to the next level. Gaz Oakley’s Streaky Bacon is a bit more involved than the other vegan bacon recipes on this list, but holy moly – look at it! You make two separate batches of seitan for this recipe, then put them together to make strips of bacon that look shockingly like conventional bacon. Use this bacon anywhere you’d eat bacon: on sandwiches, next to your favorite tofu scramble, or diced up over salads. I’m pretty convinced that chickpeas are made of magic. Their brine is a perfect egg replacer, the flour makes beautiful vegan omelets, and you can roast them up for the perfect crunchy bacon bit. 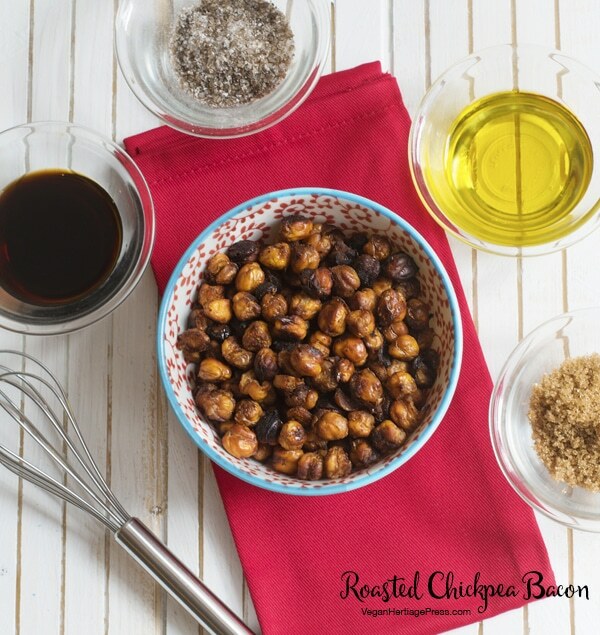 Use the Roasted Chickpea Bacon from Baconish (a cookbook all about vegan bacon!) anywhere you’d use bacon crumbles, like on salads or in a pita sandwich. Shiitake mushrooms aren’t the only fungi that make fantastical bacon. 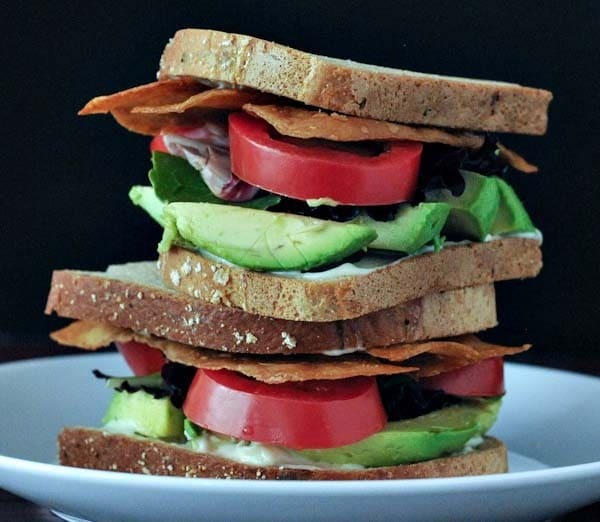 Linda from Veganosity says that this is one of the most popular recipes on her site. This is perfect piles onto a vegan BLT or the vegan bacon sandwich you’ve been missing. Eggplant has a great, meaty texture that’s perfect for bacon. Ricki’s eggplant bacon bakes up in the oven and is stevia sweetened, so it contains no added sugar. If stevia isn’t your thing, you can replace with sugar or maple syrup. 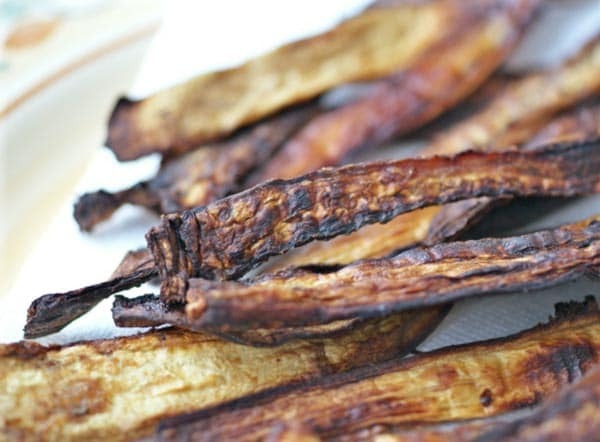 Crispy eggplant bacon is lovely on sandwiches, on its own, or crumbled over a salad. 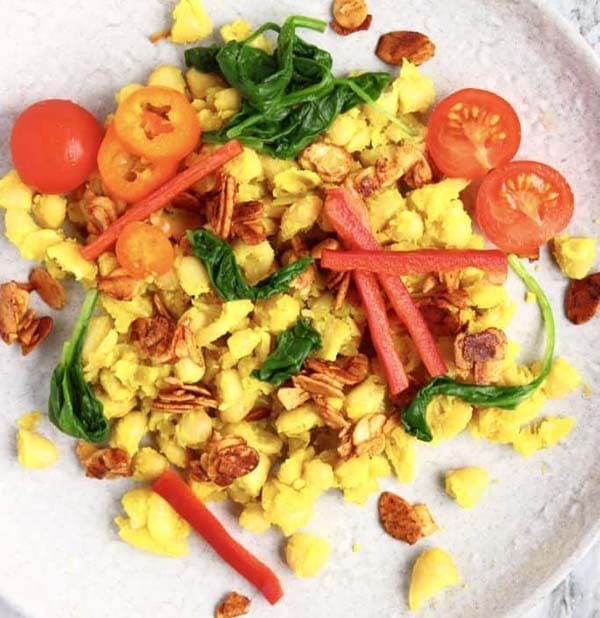 Pulse cashews in your food processor as the base for this vegan bacon recipe. Because the pieces are so small, Karissa’s vegan bacon bits cook up in record time! Use these anywhere you’d use bacon bits. On a salad, over a baked potato, or sprinkled over hummus. Sliced almonds and a super simple marinade are the keys to this smoky, crunchy, a-little-bit-spicy vegan bacon recipe. Instead of baking, you fry these up on the stovetop in minutes. Rhian created her almond bacon to use in a white bean scramble, but it would be great anywhere you’d use crumbled bacon or bacon bits. 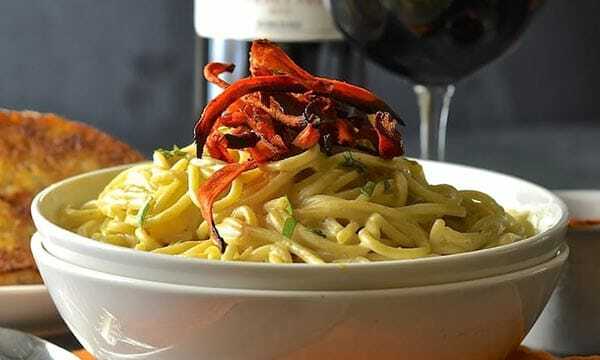 Rashers are thin slices of bacon, and Mel’s carrot rashers are perfect on top of her vegan carbonara. Toss the carrot pieces in a super simple marinade and bake, and you’re ready to bacon it up! These are lovely on pasta, but you can also use them in sandwiches, wraps, or salads. 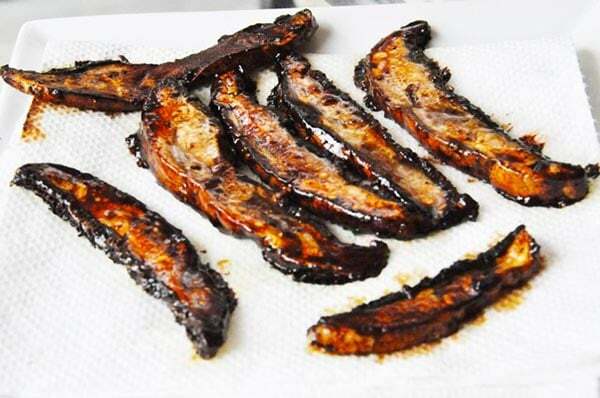 Hanne’s seitan bacon is smoky, sweet, tender, and super easy to make. If you haven’t made seitan from scratch before, don’t panic! It’s just a dough made from vital wheat gluten (NOT high gluten flour – your seitan will be a nightmare!). Her thick slices of bacon work anywhere you’d use strips of bacon, so the sky’s the limit, really. I’m pretty sure that there are as many vegan mushroom bacon recipes are there are variety of mushroom. What I love about Aimee’s button mushroom bacon is that it’s affordable, easy to make, and delicious. It gets its vibrant color from beet juice! Aimee made these to go with braised Brussels sprouts, and you can really use them anywhere you’d want small to medium-sized bacon pieces. This is exactly what I needed to see today! I flew out of O’Hare this morning and EVERY single restaurant had big piles of bacon on display. Thank you for this wonderful roundup and for including our Portobello Bacon recipe. I’m going to share this and try everyone of the recipes. Hooray! Enjoy the smoky-salty-sweet goodness, Linda!